The territory of todays Tajikistan has been under a lot of different cultural influences since the first human settlements. Rock paintings in the Pamir region, near the city of Langar, are seen as one of the evidence for an early human habitation. It is expected that the Scythians, which where nomadic people with an indo-iranian language, crossed the mountain region of Tajikistan in the millenniums before Christ. That for they are assumed to be the ancestors of the Tajiks. Alexander the Great conquered the region of Tajikistan in the 4th century B.C., which has been part of the Persian Achaemenid Empire before. After Alexander’s death in 323 B.C. the region was conquered by the Chinese Kushan Dynasty, which brought Buddhist religion and culture to the region. A 12 meters long lying Buddha figure is a witness of this era and can be seen in the National Museum in the Tajik capital Dushanbe. In the 8th century the Arabs conquered parts of central Asia and brought the Islamic religion to the region. The following Iranian Dynasty formed the Samanid Empire and made the cities of Smarkand and Bukhara to important and prosperous centers for the Tajik citizens. The Era of the Samanid Empire is until today an important source of national and ideological identity of the Tajik people. Ismoil Somoni, an Amir of the Samanid Empire (849-907 AD), is claimed to be the founder of the first connected Tajik Empire. In the expiring 1st millennium the Kara-Khanid Khanate conquered the Samanid Empire, which signalized a shift from Iranian to Turkic political and cultural influence in Central Asia. The following Genghis Khan’s invasion and the following Mongolic dominance is one of the darkest chapters of Tajik history. In the medieval times, Tajikistan belonged to different Uzbek Empires and Dynasties, but never played an important role in trade or politics. In the second half of the 19th century, Russian influence became increasingly dominant in Central Asia. In 1924 the Tajik Autonomous Soviet Socialist Republic, with its Capital Dushanbe, became part of the Uzbek Soviet Socialist Republic. In 1929 Tajikistan became a self-contained Soviet Socialist Republic, including the Gorno-Badakhshan Autonomous Oblast, in the south-east of Tajik territory. Under the Soviet Empire Tajikistan benefited from soviet infrastructure development programs. Alphabetization, education, health care, industrialization and economic growth raised the standards of living. On the other hand, the traditional Tajik cultures as well as the Islamic religion were repressed by Soviet authorities. After the collapse of the Soviet Union in 1991, Tajikistan lacked of financial support and political guidelines. Economic problems and political disagreements among regional elites led to civil war in 1991. In this period thousands of Russians, Uzbeks, Jews and German-Tajik people fled to Russia and other neighbouring countries. Finally in 1997, after several failed ceasefire periods and with support of the UN peace committee, a peace treaty between the conflict parties could be signed. The civil war led to about 150,000 deaths and over one million refugees. The German “Welthungerhilfe” supported the Tajik people since the beginning of the civil war. The Pamir region of Tajikistan was mainly supported by the Aga Khan, the religious leader (Imam) of the Nizari Ismailies. He founded the Mountain Societies Development Support Program (MSDSP) in 1993, an organization which supports development programs in education, infrastructure, politics and economy, mainly in the Gorno-Badakhshan Autonomous Oblast. With 143,000 square kilometre, Tajikistan is the smallest of all Central Asian states by area. Its landscape is dominated by high mountain regions. More than 50% of the territory has an altitude higher than 3000 meters above mean sea level and only 7 % of the national is beneath 1000 meters AMSL. Tajikistan is landlocked by Uzbekistan in the west and in the north, by Kyrgyzstan in the north, China in the East and Afghanistan in the south. The Pamir Mountains of Tajikistan have three mountain peaks with an altitude higher than 7000 meters above mean sea level (Somoni Peak, Lenin Peak and Peak Korzhenevskaya) and several mountains over 6000 meters AMSL. Only in the northern Fergana Valley and in the borderland to Afghanistan there are major areas of lower land. Barely 2,590 square kilometre of the Tajik territory is water, which contributes to the fact, that only about 6,5 % over the national territory can be used for agriculture. Tajikistan is divided into four administrative provinces (see fig. 1). The Sughd province in the north, the Region of Republican Subordination (as well called Central Region), the Khatlon province in the south and the Gorno-Badakhshan Autonomous Oblast in the east (also referred to as the Pamir region). The provinces distinguish strongly due to their different landscape and their thereby connected income possibilities of the people. Additionally, in many rural areas exists traditional Muslim local self-governments. Tajikistan is dominated by a strong continental climate. Depending on the altitude, in lower regions summers are usually very hot and dry. Winters are cold, but rather for a short time period. In higher regions like the Pamir, summers are gentle and winters can be extremely cold. There are very few precipitations all around the year, so most of the soil is very dry and unfertile. Weather can change quickly in high altitudes, in winter as well as in summer. Officially Tajikistan is a semi-presidential republic, where the President and the Parliament is democratically elected in seven respectively five year terms. In fact, the current President from the People’s Democratic Party of Tajikistan, Emomalii Rahmon, holds his fourth period as a president. Since the first democratic elections after the independence in 1994 and through the civil war his leadership stood tall. After constitutional changes, he was re-elected to a seven-year period of presidency in 1999. A referendum in 2003 allowed him to run for two more consecutive presidential periods, after his expiring period in 2006. He won the last presidential elections in 2013, although the OSCE mentioned that the election failed on many basic democratic standards. Transparency international rates Tajikistan with a score of 23 points on rank 152 of 175 states in the last quarter of all nations in the Corruption Perceptions Index 2014. Extensive cultivation of cotton was introduced under soviet sovereignty and is until today Tajikistans main agricultural export product. This leads to several financial and ecological problems. Only 7% of Tajiks national territory is cultivable land and on one third of this area cotton is being grown. Since it is mostly in monocultures, it leads to erosion and unfertile land. Additionally, the cultivation of cotton requires high quantity of water and is very sensitive to changing weather conditions. The price of sale depends on the global market and cannot be influenced by the producers. Though, one third of national taxes income is generated through cotton growth, a main reason why the cultivation is degreed by the state. Besides cotton there is a cultivation of fruits like apples, apricots and grapes. Furthermore nuts, vegetables and small quantities of crops are produced. The main export product of Tajikistan is aluminium, another product which price depends on the global market and needs a lot of water for production. The state owned Tajik Aluminium Company holds the largest aluminium plant in central Asia, which is located close to Dushanbe. This plant consumes about 40% of energy that is produced in Tajikistan. All electric power in Tajikistan is produced through hydrodynamic power plants. The power plant in Nurek is known for the highest dam in the world. The export of electricity capacities shall become an increasing factor in future Tajik economy. Tajikistan owns mineral resources like stone coal, oil and gas as well as iron, uranium, wolfram and some metals like silver and gold. The mining of these resources is due to lacking infrastructure and inaccessible mountain regions very difficult. Never the less, about half of the GDP in Tajikistan is generated through immigrant remittance, mainly to the Russian constructing sector. Tajikistan is still the poorest country in central Asia. The current economic situation is still fragile, mostly due to corruption and economic mismanagement. Most Tajiks identify themselves more with the region of their origin then with their nation. This leads to very diverse cultures and rituals, but was also a main source for animosity during civil war. Tajikistan has a very young population, with a median age of 23.5 years and slightly more women than men. Most Tajiks marry or get married through an arrangement by their parents between the ages of 19 to 24 and then soon give birth to 2-3 children. It is very common for Tajiks to live in big families. In cities, families with the same origin usually live in the same neighbourhood. The woman becomes a part of the husband´s family after their marriage. Most Tajiks are Muslim with a distinction between 85% Sunni Muslim and 5% Shia Muslim, only 10% of the population is of other religious belief. Tajik is the official language in Tajikistan, which derives from the Persian language of Farsi. Due to the long-time of soviet sovereignty, most elder people speak fluently Russian as well as the immigrant workers who work in Russia. In the Pamir region additionally several local languages like the Šugni are spoken, mostly without literary language. Tajik is written in a modified Cyrillic script. In state and Koran schools the Arabic script is being taught as well. For the younger generation, the Latin script becomes increasingly important, also due to internet access. The Pamir Eco-Cultural Tourism Association (PECTA) is a non-commercial organization with the aim to create and develop a modern and competitive tourist market with sustainable guidelines for the Pamir region. The PECTA was established in April 2008 with the support of the Mountain Societies Development Support Programme (MSDSP), a project of the Aga Khan Foundation. The MSDSP, founded in 1997, continued the work of the Pamir Relief and Development Programme, which consisted primarily on humanitarian relief during the civil war (1993 to 1997). 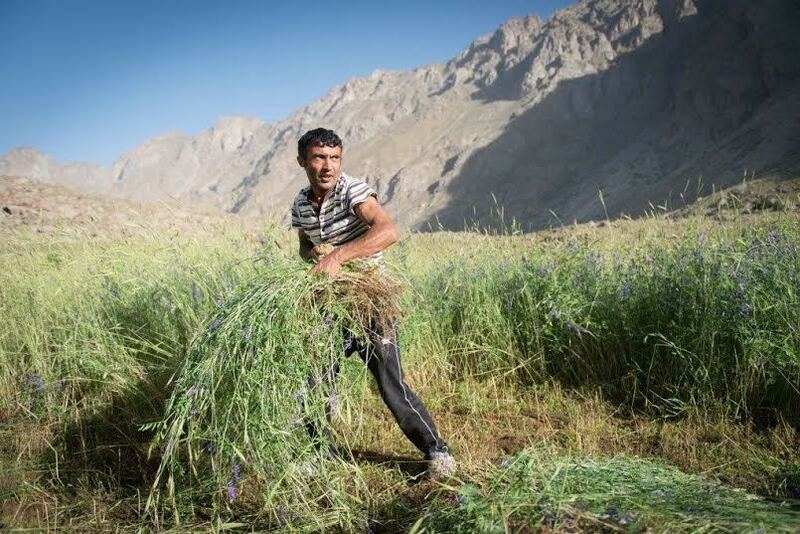 To solve the problem of food shortage, the programme tried to increase self-sufficiency through agricultural reforms, technical advice and credit services to private farmers in the Pamir region. When the programme began to operate in the Rasht Valley, located in the Central Region of Tajikistan, the name MSDSP was adopted. MSDSP’s current efforts include developing a strong civil society at local government level. To increase national work possibilities, tourism can be an effective strategy. Located in the service sector, tourism is very job-intensive and the possibilities of replacing people by technology are extremely limited. Many jobs in the tourism sector require only low- or medium level qualifications, which give people with little training the chance to participate in the job market. If touristic stakeholders are part of local communities, value creation through tourism would stay inside these communities. To attract international tourists, sustainable tourism services and products should be created. Furthermore to raise the awareness for nature protection, environmental education among the local communities needs to be improved. As an umbrella organization, PECTA contributes to the development of travel agencies and marketing of tourist services. The association helps to set up favourable financial and economic conditions for members of the PECTA and lobby their interests and services at the national and international market. Ecological and community based tourism is fostered to alleviate poverty level, for example by the development of local handicrafts and folk art of the people of Pamir to provide tourist market and revival of the basics of the traditional economics. Beside these strategic aims, PECTA provides various touristic services. At the PECTA Information Centre, located at the Central Park in Khorog, tourists can get information about possible itineraries, their difficulty and accessibility, requirements for visa and permits, weather conditions and maps. PECTA doesn’t offer touristic products themselves, but connect tourists with agencies, drivers and tour guides. As a special service, they rent out mountaineering and hiking equipment like tents, ropes, harnesses, pitons, warm jackets, etc. Bill, S. (2010). Tadschikistan. Zwischen Dušanbe und dem Dach der Welt (1. Aufl). Berlin: Trescher. Länderlexikon. Alle Staaten der Welt auf einen Blick. (2002). Dortmund: Harenberg Kommunikation. PECTA. (2014). Proposal for Sustainable Development of Tajik National Park. Unpublished. CIA, The World Factbook, Central Asia – Tajikistan. Retrieved December 10th 2014 at: https://www.cia.gov/library/publications/the-world-factbook/geos/ti.html. Official Website of the Tourism Authority of Tajikistan, Retrieved December 11th 2014 at: http://www.visittajikistan.tj/en/abouttajikistan/. Pamir Eco-Cultural Tourism Association (PECTA). Retrieved December 12th 2014 at: http://pecta.tj/index.php/about-pecta. UNESCO. World heritage Convention. Tajik National Park. Retrieved December 11th 2014 at: http://whc.unesco.org/en/list/1252/multiple=1&unique_number=1907. Wikipedia. Free Encyclopedia. Tajikistan. Retrieved December 10th 2014 at: http://en.wikipedia.org/wiki/Tajikistan.